The designers at Balenciaga must be big Ikea fans, because the French fashion house just unveiled a fancy new leather bag that looks strikingly like Ikea’s famous blue tote—though the price tag looks a whole lot different, as Adweek reports. This was too much comedy for Ikea to process silently. 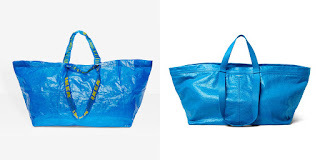 In Sweden, at the urging of its agency partner Acne, Ikea (via in-house shop Ikea Creative Shop) whipped up a print ad and a social post comically explaining to readers how to tell the difference between Balenciaga’s bag and Ikea’s. Date : 5/15/2017 11:28:00 π.μ.